We’ve been touting blueberries for the last couple of years. It’s almost as if they’ve been rediscovered! One of the reasons for all this press is the health benefits that have recently been found. Another factor is that blueberries are really good container plants. And last, but not least, are the new varieties that can be grown in areas with almost no cold and relatively alkaline soil. We do, however, recommend that you amend your soil if it is alkaline with an acidic soil amendment, such as peat moss or an azalea-camellia mix. Monthly applications of an acidic fertilizer during the growing season will produce the best results. 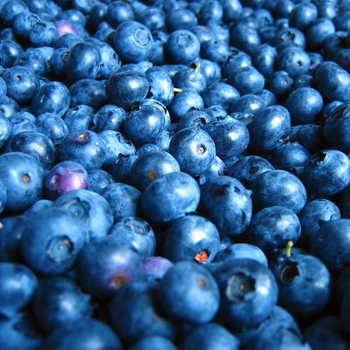 The blueberries we carry are called Highbush blueberries which are known for the best quality berry. The plants are generally upright, growing four to six feet. They make attractive landscape plants in addition to their culinary uses. Blueberries are delicious in pancakes, muffins, in fruit salads, pies and sauces. We’ve included a muffin recipe below. Since blueberries produce best with two different varieties, you can plant two together in a large container, such as a half wine barrel. Fill the bottom of your container and pack it down, Place the blueberry inside and fill around the roots. Don’t let the container dry out completely! A mulch on the surface will help retain moisture. This is also important to remember when planting in the ground. The plants do not like to sit in water, neither do they wish to be dry. The roots are near the surface so be careful when weeding and avoid cultivating around them. Dave Wilson Nursery advises avoiding fertilizer containing nitrogen in nitrate form. In hottest climates, afternoon shade is advisable. It will take two to three years to get a full crop. An adequate yield requires about one plant per person – but that, of course, depends on how much you like to eat and cook with your crop! Blueberries need very little pruning; simply remove the dead wood every year. The following container mix is the one recommended by Dave Wilson Nursery, supplier of most of the blueberries we sell. Next, choose a container. A small plant, such as one grown in a gallon pot, should be replanted in a 2 to 5 gallon container. Larger plants, 2 to 5 gallon size, should be planted in a 16 to 20” container. Thoroughly blend first five ingredients in a large bowl. Beat the egg lightly in a small bowl. Add the milk, oil, vanilla and lemon rind. Add wet mixture to dry. Stir just until flour is moistened. Lumpy is good. Add blueberries gently. Fill tins ¾ full. Bake 20 to 25 minutes until tops are golden. No. 1 variety, the standard of excellence. Very productive, upright, vigorous bush. Ripens mid season. Large, firm, flavorful blueberry does not drop or crack. Tolerates hot summers if soil is moist, acidic, and high in humus. 800 hours. Self-fruitful. Hardy to zone 4. Best blueberry variety for hot climates. Fruit is large and firm with excellent flavor. Vigorous, upright bush is very productive. Ripens mid season. Requires soil that is moist, acidic and high in humus. 800 hours. Self-fruitful. Hardy to zone 4. Southern highbush variety with high yields of large, firm dark blue berries. Flavor is sweet and subacid. Vigorous bush with upright and slightly spreading habit. Early ripening and needs very little chill, similar to Sharpblue. Hardy to zone 8. Outstanding flavor for this early season blueberry. Fruit is medium to large, light blue. Consistently productive bush, even in less than optimum blueberry sites. From USDA breeding program in Mississippi. Upright bush grows to five to eight feet. Ripens early season. 4-500 hours. Hardy to zone 5. Evergreen variety bears heavy yields of medium to large flavorful fruit. Ripens mid to late season. Orange foliage over winter. Grows to six feet tall. Zones 5-9. 5-600 hours. Early. In the West, Misty is quite vigorous, growing very well both on the coast and in inland. Excellently flavored blueberry does well in areas with chilling as low as 150 hours and all areas with mild winters and hot summers. Self-fruitful. Hardy to zone 5. Beautiful and striking bright pink fruit that is sweet with translucent flesh. Perfect combination of an ornamental and fruit producing plant! 200 hours. Hardy to zone 4. Medium sized fruit with outstanding flavor and a unique, crisp, almost crunchy texture. Hot pink blooms cover the bush in spring, giving way to loads of light blue berries. Upright narrow bush to five to six feet tall. Vigorous, easy to grow, thrives in hot or cool coastal climates. Ripens mid season. 4-500 hours. Self-fruitful. Hardy to zone 4. Large fruit; 75-80 berries per cup. Most adaptable of the low chill blueberries; performs well in heavy to sandy soils. Good for fresh use. Requires frequent harvesting to retain high quality in hot weather. Ripens early. Will grow where there are practically no chilling hours. Hardy to zone 7. Superior flavored blueberry with a long harvest time. The bush is vigorous, upright and does especially well in lighter sandy soil or with generous additions of organic matter. This Florida native is performing well in California, both inland and on the coast where chilling hours reach 2-300 hours. Ripens mid season. Zones 6-9. Dwarf southern highbush cultivar - three to four feet tall and wide. Semi-evergreen, particularly good for container gardening. Firm blueberries, 80 per cup. Yields of five to ten pounds per bush. Good fruit quality. Ripens mid to late season. More tolerant of high pH soil than other southern highbush and rabbiteye types. Hardy in zones 5 to 10. 150 hours.